LifeNet takes great pleasure in selecting Chris Moore as our 2016 Star of Life representing our Oklahoma Division. His peers proudly chose him as a true example of prehospital excellence. 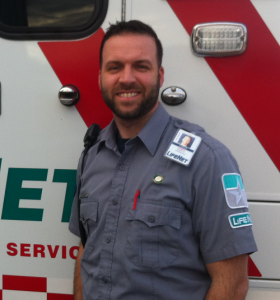 While Chris has been with LifeNet for less than two years, his involvement in EMS began in 2005 and extends over several years of field experience and classroom influence. Chris possesses a never-ending drive for excellence that he embodies during patient care, instruction, and while at the station. communicate his excitement for education to others in easy-to-learn formats. His students praise his ability to break down difficult concepts, and this affinity for sharing knowledge has led Chris to be a “go-to” instructor for his coworkers and managers. If a complicated subject needs to be communicated, Chris is the first to step up to develop a comprehensive and clear method of presentation. As a Field Training Officer for LifeNet, Chris uses his experience to influence the development of new employees as well as to foster the growth of tenured providers. The patients and customers Chris serve always have praise for his care and compassion. Little do they know the effort he puts forth before the call with protocol development and operational influences that positively impact the outcomes for all of our patients. Chris is known as a family man and for his spiritual walk. Chris and his wife, Caitlin, along with their son and daughter, recently served as a foster family for a young child in need of love and attention. Chris and Caitlin are active in their church and community, and they bring warmth to any gathering of LifeNet employees.